Fizzy Cherry Cola Bottles - Remember when Cherry Cola was the in thing in the 80s? The cola and cherry flavours went really well, and so they started making these little beauties - similar to the old favourite, the Fizzy Cola Bottle, but with a del... More..
Fizz Balls - Raspberry - These are the closest thing we`ve found to the original Fizz Bombs you used to get from your local sweetshop... they`re lovely and fruity, but most important of all, they`re very very FIZZY!The raspberry flavour is very sour,... More..
Fizzy Cola Bottles - there are loads of cola bottles around - we have searched around to find the ones with the fizziest, sourest bite. You will not be disappointed! - Qty In Order: a quarter of a kilogram - just over 8.8 ounces... More..
Cherry Fizz Wiz - everyone remembers Space Dust don`t they? Some called it Moon Rocks or Moon Dust, others Popping Candy... but the recipe was still the same: put a little of it in your mouth... and feel your tongue tingle with all of the crackles... More..
Fizzy Jelly Mix - an assortment of fruit flavour jelly chews - all with a fizzy sugary coating. - Qty In Order: a quarter of a kilogram - just over 8.8 ounces... More..
Cola Fizz Wiz - everyone remembers Space Dust don`t they? Some called it Moon Rocks or Moon Dust, others Popping Candy... but the recipe was still the same.Put a little of it in your mouth... and feel your tongue tingle with all of the crackles th... More.. Strawberry Pencils - long (about 24cm or just over 9 inches! ), soft, chewy, strawberryey(!) sweets - with a fizzy sugary coating. - Qty In Order: 10 pencils... More.. Giant Fizzy Blue Bottles - Giant versions of our standard Fizzy Blue Bottles, just because we love supersized sweets around here. 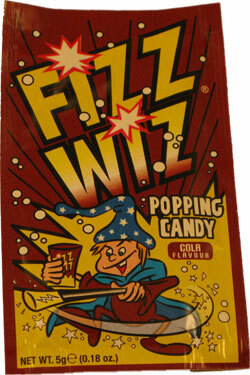 They`re delicious... very fizzy, with a blackberry, blackcurranty and somewhat bubblegummy flavour to them. And the ... More.. Giant Fizzy Cola Bottles - the name says it all! Big and juicy. - Qty In Order: a quarter of a kilogram - just over 8.8 ounces... More.. 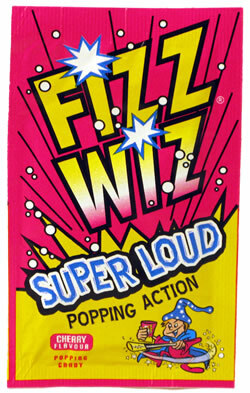 Lemonade Fizzballs - A winning combination of a lemonade flavour boiled sweet with built-in fizz. They`re made by our pals in Yorkshire, and they are absolutely delicious. A great old favourite! And the great news is, they have absolutely NO artif... More..